It was one of those days. The carpenter needed architrave and beading for the new door; the office needed some copy for Valentine's Day; a small boy and two of his friends needed fetching from school and feeding; and the school Winter Fair desperately needed cakes, biscuits, nearly new and homemade crafts. Two hours later, I had these, cooling on my worktop (the labels and ribbons took a bit longer, but the marmalade was very quick). 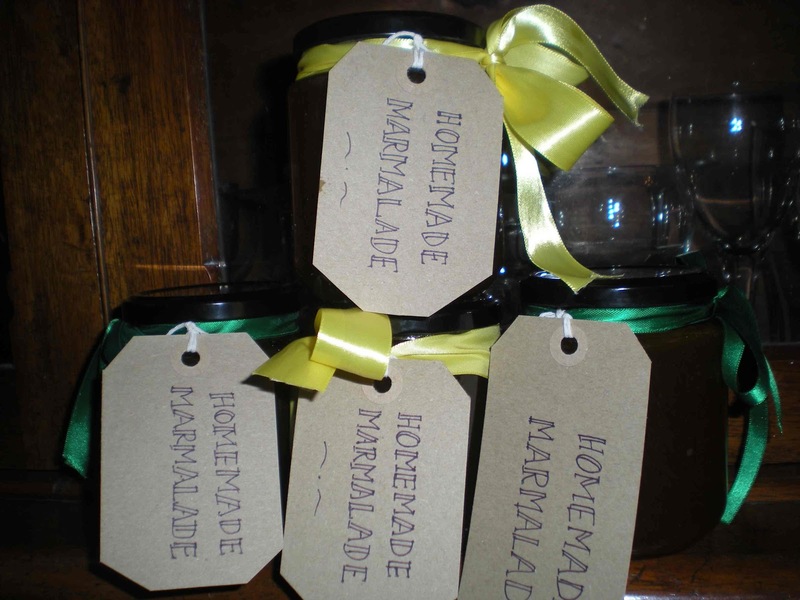 So how do you get six jars of marmalade in a mere two hours? Ahem. 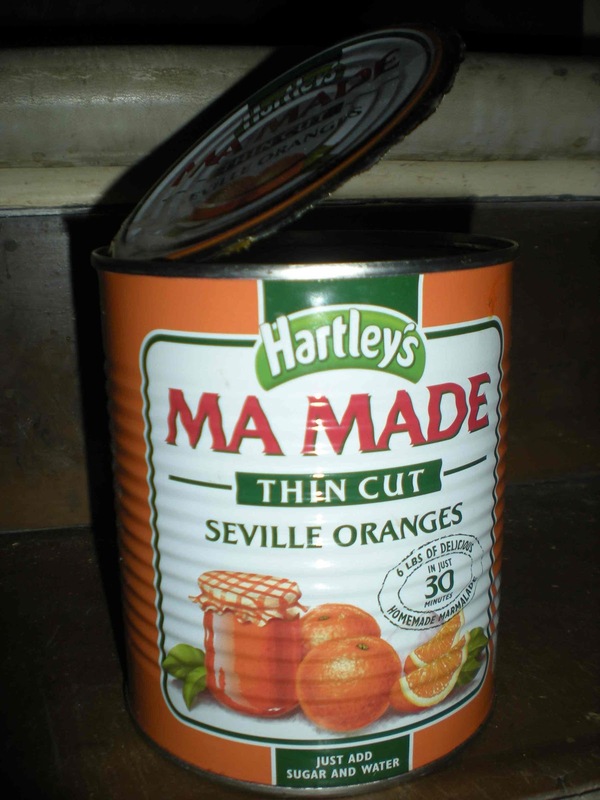 A while ago I mentioned that sales of MaMade seemed to be outstripping the sale of Seville oranges at my local Waitrose. So, seeing it was good enough for the neighbourhood, I thought I should try it. I bought a tin, but it has been sitting in my pantry ever since, waiting for a marmalade emergency just like this one. So I opened up the tin, tipped the orangey sludge into the preserving pan, added water and sugar and boiled it up. It reached setting point very promptly (in 15 minutes) and the peel was gratifyingly thin, much thinner than I ever manage. So I poured it into six jars, put the lids on and turned them upside-down to sterilise them, then headed out to collect six metres of nicely moulded architrave for the carpenter. When I got back, I turned the jars back the right way up. The marmalade didn't move. It clung determinedly to each lid, leaving a peculiar half-inch of empty space at the bottom of each jar. The damn stuff had set so hard, the air couldn't percolate back up to the top. I now had six jars of Weird Marmalade. I looked at the label on the tin. It read 'Prepared Seville bitter oranges, sugar, citric acid, gelling agent (pectin)'. Grr. Seville oranges are stuffed with pectin, why add more? I waited hopefully for the orangey mass to surrender and slide down the jar, but it refused to co-operate. There was nothing for it but to empty them back out, add a bit more water, boil it all up again and put it back into the re-sterilised jars, this time inverting them for just a few minutes. You live and learn. But the marmalade tasted pretty good - not as strong and bitter as the real thing, but definitely edible with more of a bite than a lot of the commercial stuff. So if you are a parent at a well-known north London primary, and you bought a jar that looked like this at the Winter Sale, my apologies for the less-than-authentic preparation, but I hope you like it nonetheless. Please do let me know.